It was a joyous occasion, made more memorable, by the attendance of members, volunteers, friends and special guests. Special guests: The Ven. Chi Kwang Sunim, members of Buddhist Council of Victoria (BCV) and Dharma Teacher Andrew Williams. Ven. 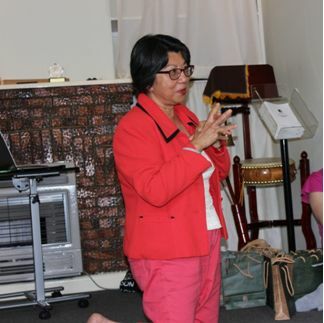 Chi Kwang shared her encounter with our late Master Sheng Yen, in 2006, at a Global Women’s Initiative of women spiritual leaders. 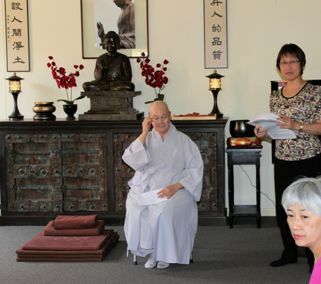 She was deeply moved by Master Sheng Yen’s various efforts in his life time; particularly, his teachings on equality, kindness and compassion. He said that we need to start with compassion within our own heart first, our family and our community. We were also reminded of his work on interfaith, and his encouragement for women and youth to participate in spiritual works. Ven. Chi Kwang also described Master Sheng Yen as a great scholar and Buddhist master. He had the ability to influence many by his own example, through his compassion and generosity. Chairperson for BCV, Peggy Page, also gave a summary of the work of her organisation which started operation in 1995. 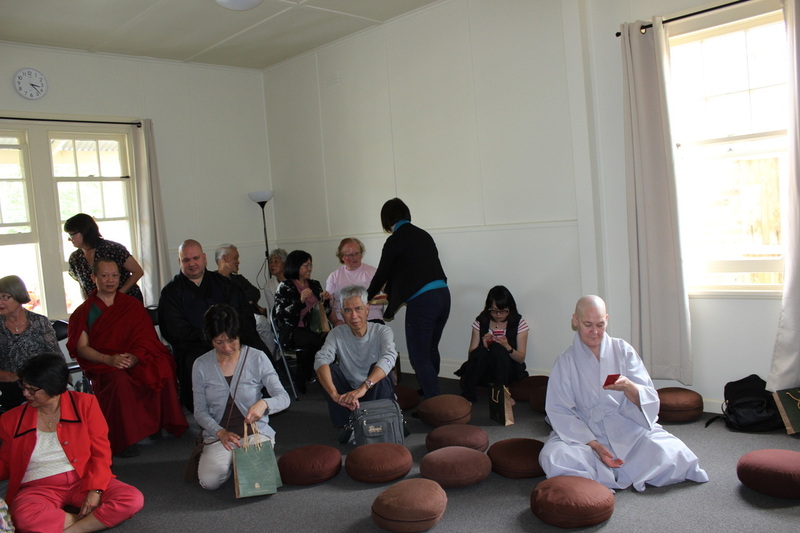 Other than their Buddhist Education in School program, Prison and Healthcare chaplaincy, and they are now working on pastoral care for the aged. · Blessings lie in knowing our good fortune, Blessing comes from being content; Happiness is giving and being grateful. 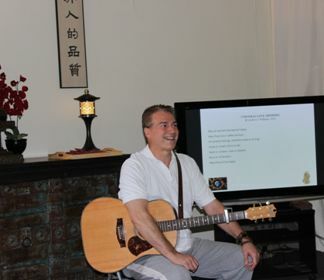 Mr Andrew Williams gave us another inspirational performance – playing his guitar and singing ‘Universal Love’ and ‘One People’. We were encouraged to sing along. 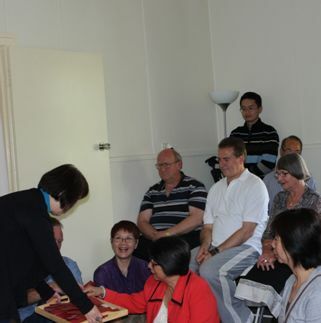 Presents were then given to members and volunteers for their great efforts in assisting the centre. 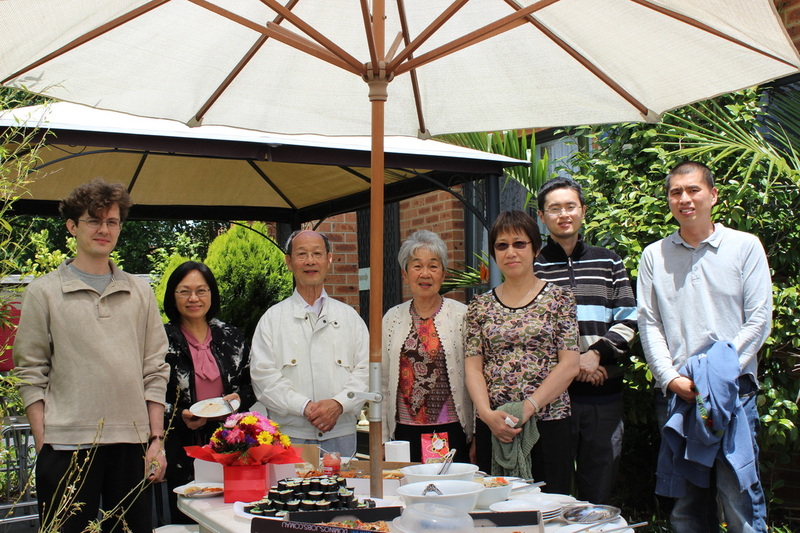 We then proceeded to afternoon tea. A joyful time of relaxing and engaging in further communications; and reminding ourselves of the blessings of this precious human life and the teachings we received.